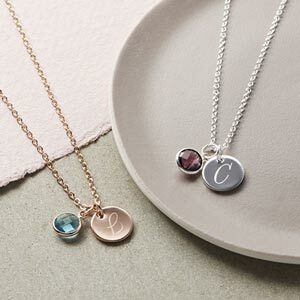 Violet Personalised necklaces are beautiful silver plated or sterling silver chains with a bespoke charm range whereby you can create your own jewellery for that special day. Violet is available in children's size and standard size with a variety of silver plated charms as well as semi-precious stone hearts or pearl charms. A special, personalised gift for your beautiful bridesmaids. Also, why not personalise your item with beautiful engraved or hand stamped silver plated letter charms, to make your gift that extra bit special. 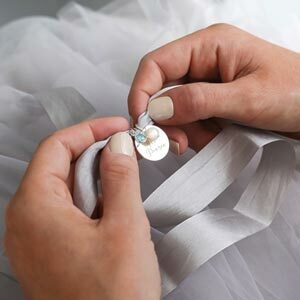 The hand stamped charms and engraved charms are prepared by our experts in the studio. Your memorable words, names and dates will create a special gift to be adored forever. We have a variety of free gift cards to choose to accompany your order as well as an option of luxury packaging. Rose quartz is for love. Silver plated necklace. Silver plated or semi-precious stone charms. The engraved, hand stamped are sterling silver.